OK, so did you know this was coming? :) I tried not to post all of my fun body care stuff together, but I LOVE this stuff and couldn't wait any longer! I am addicted to hand sanitizer because of my job, so I wanted to find something that wasn't your typical "anti-bacterial-dry-your-hands-out-stinky" hand wash that had the qualities of a moisturizing soap... and this is my favorite! I ADORE the scent, too! 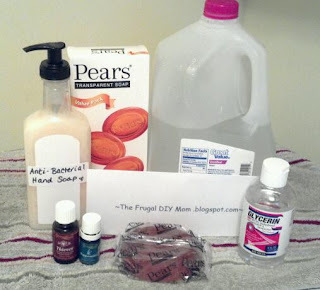 Here's what you will need to make your own antibacterial hand soap...super simple! 1 bar of transparent (all natural if you can get it) soap...but you can probably use any kind. This Pears brand is from Rite Aid and I got it for .29 after coupons! -Just grate the soap into your stainless steel bowl...I use the same grater and bowl each time I make soap. CAREFULLY pour your boiling water into the soap and slowly stir until dissolved. -After it has cooled, add your 8 drops of essential oils and 2 tbsp glycerine. You may need a whisk to break up the soap a bit, just don't stir too much to create bubbles. -Funnel the soap into the container! Again, mine seemed a bit thick when I was funnelling, but it was just right when I pumped it out of my container! And it smells SO good! The extra soap can be kept in an old plastic juice bottle or milk jug. I do label mine and try to use regular soap when I am just washing off "dirt" and antibacterial when I just feel plain "icky" with germs! Enjoy! NOTE: Keep your essential oils out of reach of children, as usual! If you have sensitive skin, just try a tiny bit to begin with. I have sensitive skin, but don't have difficulties with these oils...but you never know! What other products have you made at home? I like your post! Your handmade soap recipe is so wonderful.